Blogs Home | Why Wales? Discover Britain's Road Less Traveled! Wales is an ancient landscape, with history and myth wherever you look. It’s a land of majestic castles and mighty mountains, fringed by an award-winning coastline. The Welsh language is a living link to their Celtic ancestors. Their spellbinding stories tell of legends like King Arthur and Merlin as well as local heroes like the rebellious, Owain Glyndwr – the 13th century Prince of Wales. In 2017, Wales is celebrating the Year of Legends to honor the country’s folklore, history and champions. Here’s where to find them. The Epic Battle Between The Red Dragon And The White Dragon Took Place In North Wales. According to the legend, in the 5th century, the mythical figure, King Vortigern set his sights on the village of Dinas Emrys in the Snowdonia National Park. He began building a castle to protect his kingdom from enemies. Every day, his men worked hard to construct the fortress. However, every morning they woke up to the castle walls and foundations demolished by unknown forces. King Vortigern was advised to seek a young boy, born to a human mother and father ‘from the other world’, and to sacrifice him. He found such a boy, who would later become the wizard, Merlin. Merlin was unaware of the plan that he was going to be put to death. He explained to Vortigern that the castle couldn’t stand up due to a hidden underground pool where two dragons lived. Vortigern’s men dug deep into the ground where they discovered a subterranean lake. They drained it, and as predicted by Merlin, they found a sleeping red dragon and a white dragon, who soon woke up and began to fight each other. The red dragon won, and the white dragon fled. The boy, Merlin, said that the white dragon represented the Saxons, and the red dragon represented the Celts, Vortigern’s people. According to the Victorian era volume, ‘History of the Kings of Britain,’ by Geoffrey of Monmouth, the red dragon was a prophecy of the coming of King Arthur, whose father’s name was Uther Pendragon, ‘Dragon’s Head’ in English. Travelers can walk up Dinas Emrys today for breathtaking views of the magical countryside. But be sure to tread carefully – there’s a dragon sleeping underneath. Not convinced? A 1945 excavation of the site revealed a lake and fortress dating back to Vortigern’s time – the 5th century. The walls showed signs of having been rebuilt time and time again. No one knows for sure whether King Arthur was Welsh or whether he was even a real figure in history. Still, several legends place him in Wales and the first known reference to him was in a Welsh poem written around AD 594. In the 11th century, Geoffrey of Monmouth – a Benedictine Monk wrote the book ‘Historia Regum Britanniae’ on the history of British kings. Although much of his work is believed to be fictitious, it helped popularize the legend of King Arthur around the world. In the book, Geoffrey portrays Arthur as a majestic and much-loved man, who held his court in the town of Caerleon. Caerleon, known as the ‘fortress of the legion,’ is one of Britain’s most important Roman sites. It was a Roman military base from the 1st and 4th centuries, which continued to exert influence over the native Celtic Britons long after the Romans had left. Caerleon is home to the best-preserved Roman amphitheater in Britain, Roman barracks and baths as well as the National Roman Legion Museum. Some believe that these ruins became King Arthur’s round table after the Romans retreated. The country is riddled with sites that have Arthurian links Caerleon isn’t the only one. In Snowdonia National Park, two Welsh lakes, Llyn Llydaw and Llyn Ogwen are said to be the resting place of Arthur’s sword, ‘Excalibur.’ Not too far from the lakes in North Wales, legend also says that Arthur killed Mount Snowdon’s resident giant, Rhitta, and his men supposedly covered the corpse in stones at the summit of the peak – the highest peak south of the Scottish border. Travelers can hike to the top or take the Snowdon Mountain Railway. St. David was born in the year 500 as the grandson of the king of Ceredigion. According to the legend, St. Non gave birth to St. David in Pembrokeshire during a fierce storm. His birthplace is marked by the ruins of Non’s Chapel, and a nearby holy well is said to have healing powers. St. David’s most famous miracle took place while he was preaching to a crowd. When some attendees complained that they couldn’t hear him, the ground on which he stood rose up to form a hill, so that he could be heard from a great distance. Suddenly a white dove settled on his shoulder. St. David was a medieval bishop who is believed to have died on March 1 in the year 601 CE. The date became a national day of celebration in Wales during the 18th century, and it was made a public holiday in 2000. For many centuries, St. David has been a symbol of Wales and Welsh independence. The daffodil and the leek are emblems of St. David and of the day that bears his name – St. David’s Day, is celebrated on March 1. In the 12th century it was declared by the Pope that two pilgrimages to St. David’s Cathedral in Pembrokeshire were equivalent to a pilgrimage to Rome; three to St. David’s matched one to Jerusalem. Travelers can make their way to St. David’s Cathedral in Pembrokeshire to learn about the history of the Welsh saint and visit the treasury that houses artifacts dating back to the 12th century. St. Dwynwen is the Welsh patron saint of lovers, which makes her the Welsh equivalent to St. Valentine. She lived during the 5th century and legend tells that she fell in love with a prince named Maelon Dafodrill, but her father had already arranged her marriage. Dwynwen was so upset and asked for God’s help to forget the prince. An angel visited her and after giving Dwynwen a potion to forget him, the angel turned him into a block of ice. God then granted her three wishes. Her first wish was that Maelon be thawed. Her second wish was that God should meet the needs of all lovers. Lastly, her final wish was to never marry. All three of her wishes were fulfilled and as a sign of her appreciation, Dwynwen devoted herself to God’s service. 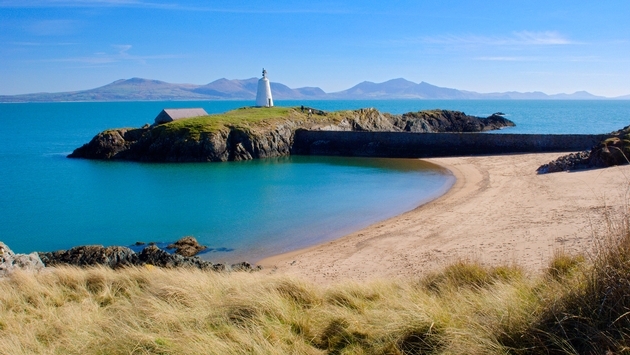 She spent the rest of her days on Llanddwyn Island, off the coast of the Isle of Anglesey in North Wales, where she set up a convent. Lovers can head to the island to visit Dwynwen’s Well. It is said that if fish are seen to be active on a couple’s visit, the husband will prove to be a faithful one. The people of Wales celebrate St. Dwynwen’s Day on Jan. 25 to honor her. Visit Wales is the New York-based government tourism office for Wales, one of four countries that make up the United Kingdom. A land with 641 castles, 870 miles of walkable coastline, three national parks and award-winning cuisine, Wales offers travelers a variety of activities and different landscapes to explore. The country's Celtic history and ancient language make it a distinctive British destination. For more information on Wales travel, trade can visit www.trade.visitwales.com and consumers can visit www.visitwales.com/americas.